Best Compact Flash Card Recovery Software, recovering files in 3 Steps! Compact Flash Card Recovery Pro has helped so many card owners get their missing or corrupted files on compact flash card. When the card data is missing due to accidental deletion, corruption or other reasons, Compact Flash Card Recovery Pro can always give you a surprise. It is now used for a variety of devices; most contain flash memory but some, such as the Microdrive, contain a hard disk. 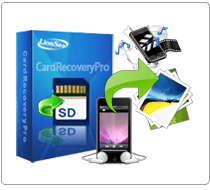 Compact Flash Card Recovery Pro is a professional compact flash card recovery software, which occupies essential place in recovering CF card field. Compared with other card recovery software, Compact Flash Card Recovery Pro is able to recover deleted photos easier and more effective. STEP 1andnbsp;Downloadandnbsp;CF Card Recovery andamp; Install it for free. 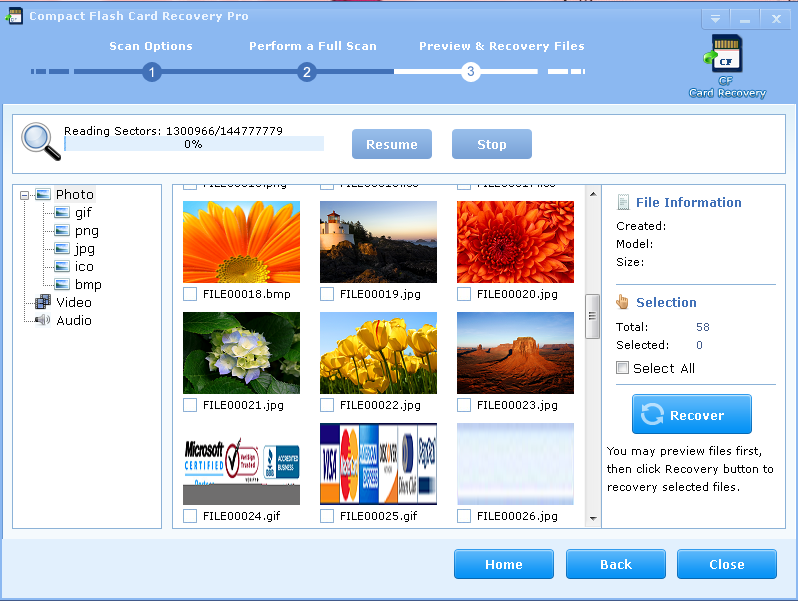 STEP 3andnbsp;When the scan is finished, select the pictures you want and click [Recover] button to restore the files. This software presents their customers an easy-to-use interface. Even though you are a computer novice, you can undelete your formatted CF card with ease. Moreover, it is to be observed that this tool is capable of recovering lost photos, undeleting missing pictures, retrieving formatted data and restoring deleted files. It also owns the ability of retrieving large video and audio files. No matter what format of files you want to get back, Compact Flash Card Recovery Pro will not let you down. The video file formats it can recover including AVI, MP4, MPEG, 3GP, AVCHD Video File (MTS), Matroska Video File (MKV), MOI Video File, Divx Encoded Movie File (DIVX), Video Object File (VOB), OGG Media Player (OGM), ASX, 3G2. The audio file which it can recover includes MP3, WMA, WAV, RPS, AU, MIDI, AIFF, OGG, RM, RA, M4P and M4A. Above are the formats that supported by Flash Card Recovery Pro. This software supports nearly all famous digital camera brands in the market, such as Nikon, Canon, Kodak, FujiFilm, Casio, Olympus, Sony, SamSung, Panasonic, Fuji, Konica-Minolta, HP, Agfa, NEC, Imation, Sanyo, Epson, IBM, Goldstar, LG, SHARP, Lexar, Mitsubishi, Kyocera, JVC, Leica, Phillips, Toshiba, SanDisk, Chinon, Ricoh, Hitachi, Pentax, Kinon, Verbatim, Vivitar, Yashica, Argus, Lumix, Polaroid and Sigma. 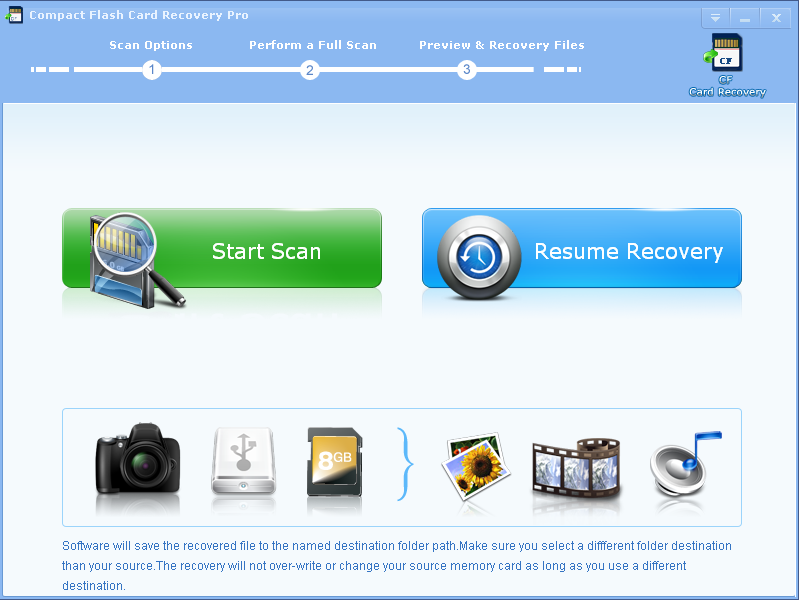 * Compact Flash Card Recovery Pro will undelete all type of files from your Compact Flash card card or disk.